Maui Moisture products start with a unique blend of aloe vera juice and is infused with pure coconut water, unlike some other shampoos that start with deionized water as their first ingredient listed. The results? Moisturized strands, mended split-ends, and a healthy glow with every use. To use: After shampooing, apply conditioner generously to hair, working through to ends. Wait 3-5 minutes. Rinse hair thoroughly. Warning: Avoid contact with eyes. If contact occurs rinse immediately. 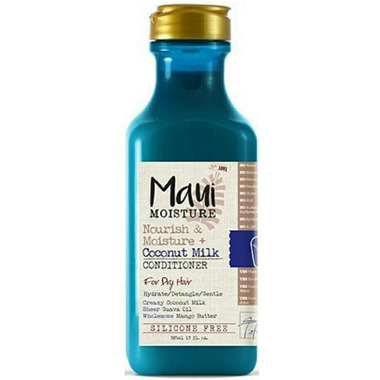 For best results use in conjunction with other Maui Moisture products. As good as I look and smell, please do not drink me! Ingredients: Aloe Barbadensis Leaf Juice, Water (Aqua), Behentrimonium Chloride, Cetearyl Alcohol, Cetyl Alcohol, Glyceryl Stearate, Alcohol, Cocos Nucifera (Coconut) Water, Cocos Nucifera (Coconut) Fruit Extract, Psidium Guajava (Guava) Seed Oil, Mangifera Indica (Mango) Seed Butter, Cocos Nucifera (Coconut) Oil, Panthenol, Caprylyl Glycerin/Sebacic Acid Copolymer, Diheptyl Succinate, Polyquaternium-10, Polyquaternium-37, Propylene Glycol Dicaprylate/Dicaprate, PPG-1 Trideceth-6, Tapioca Starch, Glycerin, Propylene Glycol, DMDM Hydantoin, Diazolidinyl Urea, Iodopropynyl Butylcarbamate, Fragrance (Parfum). Love this conditioner. Leaves my long hair soft and smells great. I would buy again. Love it! I use it with the shampoo and it makes my hair so soft and moisturizes so well that I don't need anything to help detangle my very long hair, and the scent is very subtle and natural. It's also so light that it enhances the natural beachy waves I have in my hair, that other conditioners often straighten out, and I love the design and colour of the bottles.